Last September, we told you about an all-ages music venue and mini-arcade coming to the former site of The Metal Grill and Vnuk’s Lounge in Cudahy. Today, that exciting venture publicly announced its name and official opening date. X-Ray Arcade will open at 5036 S. Packard Avenue on Saturday, February 9. The business is owned by a group led by Direct Hit! founding member Nick Woods. Other investors include Chicago artist and Eric Baskauskas, Woods’ wife Kate, Soothsayer Hot Sauce owner Kyle Janis, as well as additional partners living in Milwaukee, Chicago, Michigan, and Minneapolis, who purchased the foreclosed property last year. The new owners of the building—which most recently was home to The Metal Grill before it abruptly shut down in June of 2017—originally said they hoped to open before the end of 2018, but the space required considerable renovations that resulted in delays. Since taking over the space, Woods says the group patched holes in walls, replaced missing floorboards, installed new fixtures, repaired siding and the roof, repainted the interior, and updated plumbing and electrical. The bar top was refinished and The Metal Grill’s untended draft system was replaced with six brand new tap lines. Beyond the functional improvements made to the building, Woods and company also brought in approximately 15 arcade machines. “The Very Famous X-Ray Arcade” offers a respectable array of games they own and service in-house, including titles like The Simpsons, Galaga, Area 51, Maximum Force, X-Men Vs. Streetfighter, Main Event Wrestling, Blitz 99, NBA Jam, Diehard, Off Road, The House Of The Dead, Spider-Man, Donkey Kong, Lady Bug, and more. The bar’s six TVs (not counting the 162-inch projector screen behind the stage) will offer gamers the opportunity to play Sega, Super Nintendo, and NES games on emulators. Nintendo 64 consoles will also be on hand. There will be a selection of board games patrons can play free of charge. 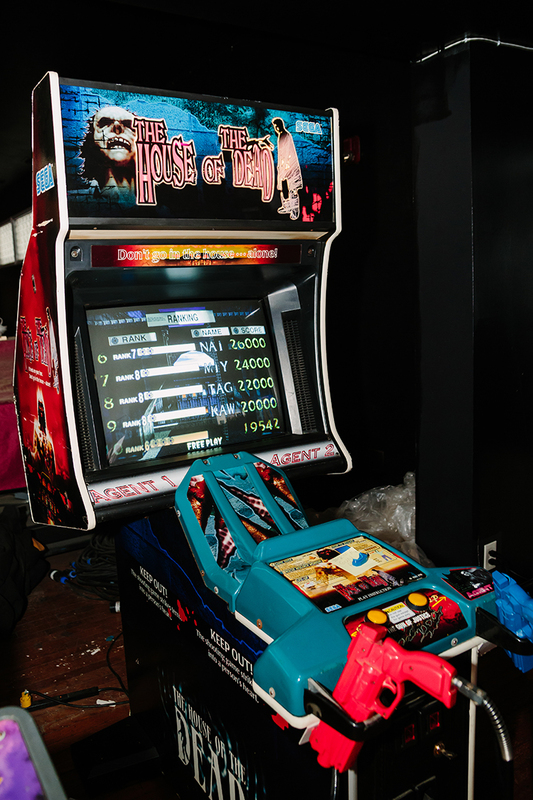 The most notable way X-Ray Arcade differs from its counterparts is in its connection to live music. Woods—who booked renowned punk bands like Off With Their Heads, 88 Fingers Louie, Negative Approach, PEARS, The Suicide Machines, The Flatliners, A Wilhelm Scream, Masked Intruder, The Copyrights, and Meat Wave at The Metal Grill prior to acquiring the property—views the business as an event space above all else. On top of gaming amenities, the 200-capacity venue with a 20-foot stage is well-suited for all sorts of live entertainment. Initially, X-Ray Arcade will have limited hours from Thursday to Sunday. Woods says he’d eventually like for X-Ray to be open six days a week and offer a variety of live shows on a daily basis. Woods says the space will host a variety of local bands in its opening month. The third installment of Woods’ biannual “Dummerfest” will reportedly be returning to the property on June 22. Unlike most other venues in Milwaukee proper, the Cudahy business plans to open its doors to customers of all age groups. There will be a number of unique non-alcoholic cocktails and punches available. Anyone who wants to buy alcohol will have to show ID and get a wristband that permits them to drink. Woods says he views X-Ray Arcade to be “a Mad Max version” of bygone family fun centers from his youth. X-Ray Arcade will be serving up empanadas from Triciclo Peru, as well as a few accessible arcade delicacies like mini pizzas. Draft options will mainly be domestic at first, with some craft beers available in bottles and cans to round out the beer list. This summer, Woods says X-Ray intends to expand its game play options out to the business’ spacious patio and potentially bring games like skee-ball, foosball, and air hockey to a proposed three seasons room addition. In the meantime, Woods and his counterparts just seem excited to start bringing new life, new events, and a new crowd to back to the longstanding Cudahy building.